I have to agree with the previous comments. I RV a lot and stay at a lot of military campgrounds and this one needs a lot of TLC. I do come here often though because it is located directly across from the beach. My first constructive comment is that Ft Fisher needs a camp host for obvious reasons. 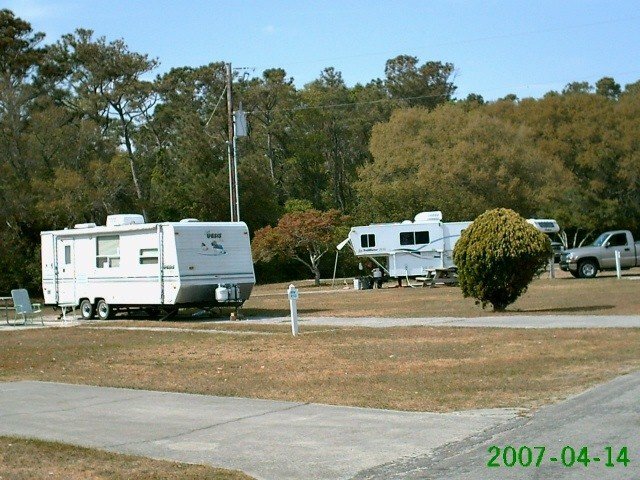 Camp hosts usually care about their RV parks and a lot of the issues the previous person mentioned would be taken care of by a camp host. Ft Fisher Management doesn't really care about the condition of the RV park and it shows. Yes, the office ladies are pleasant and nice, however, they don't make any real decisions. The bath houses are disgusting. Laundry room is usually dirty. Internet rarely works. Dumpsters are always full. The new RV pads should have been constructed so that they were wider then 7-8 feet. The driveways for the pads are like a hundred feet long but the width is not nearly wide enough. Seems silly the bar and grill isn't open on the weekend or evenings but I guess it is contracted out to civilians and the RV park has nothing to do with it. The great things about this RV park is that it is across the street from the beach, they rent golf carts, kayaks, and small boats. There is a fishing pier. This military recreation area could be a real cash cow for the Air Force if it was managed better. 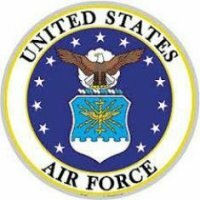 I hope those in leadership at Seymore Johnson Air Force Base read this post and look into the concerns by its customers. They are working hard to make this a great place to stay by upgrading some of the facilities. At $25 per night and just yards from the beach, it's hard to complain about Ft Fisher. However, if they don't pay attention to the small things, people may start going elsewhere. First, we were supposed to have side-by-side RV sites. They gave me sites 11 and 12 four months previous based on that request. However, in the process of pouring new concrete pads, they renumbered some of them (not all) and 11 is now several sites away from 12. Not the end of the world, as it is not a huge campground, but at least they should have told us ahead of time. We were quite confused upon our arrival, couldn't get a wi-fi or Verizon signal to call the office, so had to back a 50+ foot rig/truck all the way out of the RV area to drive down to the office to figure out what was going on. Once we finally got in our sites, we found that one had no cable hook up and the other had a hook up, but no service. Wi-Fi was down all week. When I asked at the front desk about it the lady just laughed and said "it will be fixed whenever the Army of Air Force decides to get around to it." No apology, poor customer service. Normally, I don't even watch TV or use campground wi-fi, but the RV area was a dead spot for Verizon (and my brother-in-laws ATT), so we had no connectivity at all. That makes it a bit tougher when trying to keep up with the bad weather we were having, as well as looking up things to do in the area. Also, the dumpster in the middle of the campground was not emptied for over 10 days - it was overflowing, smelled horrible, and was a gathering place for huge swarms of flies that made being outside miserable. I also told the office about this (they seemed completely unaware) and was told it would be emptied on Monday (it was Friday). I told them they needed to take care of it immediately as it was unbearable for sites close by, but no one seemed motivated to do something. It was still overflowing when we left. I found this to be representative of the staff's attitude all week. They seemed to act as if the customer was more of a burden than anything else. I've never encountered this in over 30 years of RVing - and certainly not at the commercial campgrounds up and down the coast. All in all, Ft Fisher has the potential to be a real gem, but the staff and management need to start paying attention to details or people will decide to pay a bit more and go elsewhere. Great value and great campground. Most of the new pads have been poured. The pads are exceptionally long, however, some of them are angled in the wrong direction. If you have a 5th wheel, you may struggle backing into these sites. The laundry room could use a little improvement, but not so bad as to be a deal-breaker. WiFi is non-existent. Again, not a deal-breaker. If you want to park and be left alone, this is the spot. Easy walk to very clean beaches. Nice little shoppette/PX. Can't beat the price, considering what civilians are paying 200 meters away. Location cant be beat. Lots to do in area. Some issue going on during the week I am here before memorial weekend. Pool is closed for undetermined length of time - restaurant is closed, kayak/canoe rental shop is closed as well and they are extremely short staffed. I guess they are not happy about not receiving enough funding and take it out on customers. I read where other reviews said staff was helpful- I guess that one was off today. Ive been here 3 days and asked when someone will clean the bathrooms- (trying to find nice way to tell the truth; If you don't want MRSA or Scabies or impetigo or any other fungus infections- don't use any of the bathrooms offered to campers.) I was told- "You are welcome to the job of cleaning them if you want" They double talked saying they had cleaned them- but really only restocked paper and removed trash- I was further told about being short staffed but in a very rude tone like it was my fault. I would have rather been treated more civilly with an apology and offer to clean- but I think she was avoiding that offer because she would have been the one to have to clean those nasty bathrooms. I had to go 30 min down road to another campground and pay to use there shower. Very large spaces but as other stated the hook ups can be on the wrong side and some have electric/water on one side and sewer on the other side. It is best to ask when you book and always bring plenty of water/sewer hoses and electric cable. The staff is very friendly and helpful and you can't beat the location. This is a wonderful campground, and in our estimation the best value for $ spent. Campsites are roomy, although some have hook-ups on the “wrong side.” This was not a problem as we carry plenty of extensions. Best of all — fantastic free WiFi!!! It worked flawlessly during our entire 14 day stay. Staff was extremely pleasant. US Mail/UPS/FedEx directly to Reception Office is a big plus for full-timers. Easy walk to public beach access. Bathhouse and toilets are a bit dated, and although clean, are in need of an upgrade. If coming from the south you might want to consider the Southport - Ft Fisher Ferry. The ferry accommodates RVs, is very affordable, and cuts driving time as you bypass the city of Wilmington. We will happily stay here again. First time here. I made reservations for 4 nights for full hookups, 50 amps. When we arrived, the staff in reception told us not to hook up our septic because the lift station wasn't working. We discovered later that it hadn't worked in months. Now that's not full hookups, is it? We still had to pay the full rate. They suggested we use the camp restrooms and gave us a site near the showers. They were individual rooms, a bit dated but cleaned daily (we saw the cleaning staff) and definitely old. As someone who likes showering and using the bathroom in my own rig, it was a bit inconvenient for us not to be able to connect to septic. Our site was a pull in. The electric and water were on the correct side, the septic was in the front (wrong) side. Pad was concrete. Roads were paved. Site was long and very level. No wifi so we used our jetpack. A couple sites were shady but most were open to the sky. No dog park but lots of acreage to walk the dogs. It's a small open base. No Exchange or commissary. The area is quiet, the beach is across the street. I'd stay here again but will make sure we can hook up to septic next time. We are a popup camper family, we traverse the East Coast area, We enjoyed our stay lots of military history, beaches were peaceful and serene. Fort Fisher is directly across the street from the public access to the beach, walking across the street (crosswalk) from Fort Fisher there is a great beach shower to rinse off. I stayed in RV site 18 (15$) a night. I added a pic of the location. It was directly across from the Military Museum and right outside is military equipment, tanks, trucks and helicopters. Hint use the showers in the REC center they are cleaner and in better condition. The pool wasn't opened yet for the season but it was cute and looks like fun for the kiddos. We went to the Aquarium and the Ferry, those are a must do if your going there. The rec center offered some great activities and had equipment to rent such as bikes and kayaks. there are lot of bugs so bring your coils and bug spray. there is no open flame allowed and there is not BBQs at every site so either bring your own or you could rent one. There is a byway between Wilmington and Fort Fisher that helps you avoid the town traffic so take a look at using it when you don't want to take the scenic route. Lastly this a great Military and Historic area! It always surprises me when I read reviews and people complain about bathroom and shower facilities, I expect rustic conditions its camping...... Bring soap and TP :-). Coming from the south to get to Wilmington required more downtown driving (we weren’t in coastal enough to take the ferry from Southport) than when we left going north. That way was pretty much a straight shot on good roads. Coming down Rt 421 to Kure Beach, I thought the best landmark was the white pillars either side of the road. The CG entrance was about a ¼ mile past them on the right. Our high rating of this CG is the same as what drives real estate – location, location, location! So much to see in the area and all close by with easy access. We recommend a ferry trip over to Southport, a quaint seaside town with good seafood restaurants. The sites are old asphalt pads with a concrete picnic pad with easy access to hookups. They do have cable, but you have to check out a converter box to use it; boxes that have a history of problems. They also now have Wi-Fi and we had a good strong signal. The area was unkempt with the grass was about 8” high and restrooms (none had soap) and laundry were less than clean. All of the sites are back in, but the hookups can be on different sides or even mixed depending on the site. The on-site restaurant and the clubhouse/rental center were all closed for the season. They offer off-season rates for the cabins/condos, but RVers still pay full price. There are mobile home rentals in the first part of the CG with some of the RV sites in between them. These sites are small, but the others all have plenty of space. We stayed in a motorhome. We stayed in a cottage back in 2007 that looked like an old Officer Bachelor Quarters that had two bedrooms with individual bathrooms separated by a kitchen and living room/common area. I am hoping that they have improved them since we stayed there but they were horrible. The cottage we were in needed a complete update. The unit stunk of old carpet and furnishings, the bathtub and bathroom was covered in mold and mildew, the air-conditioner stunk and the filter was full of dirt and mildew. The carpet was stained and stunk. The furniture in the common area was old and worn out. Now saying all of that about the cottages, the staff was very helpful and friendly, the location was right across the street from the beach, and the facilities were nice. The small annex was well stocked and the prices were reasonable. My father is also retired military and my daughter and her husband are active Army and my son is a former Marine. They all stayed in the campground and that area was very nice and well maintained and the bathrooms seemed adequate and clean. But since we stayed in the cottage, this reviews is based on their condition. Had a great experience here. The weather was a little on the cool side, but it was January (40s, 50s & 60's) nothing froze. We did some local sight seeing and saw the battleship NC. Wilmington's River Walk and RR Museum and other points north, Ft Fisher and Southport, NC when we went sightseeing south. TV & cable had to be set up by the technician, but the wi-fi was good, even was able to use internet radio with the password. Some of the sites have the utilities on the wrong side and you can pull through to make a hook up, but we were fine. Laundry facility and bathhouse was clean. Met some nice folks who were headed south, but we had to turn and go back north. We came here from Myrtle Beach and the ferry was amazing! I highly recommend the ferry if your coming from the south. Be advised the instructions to get to RV park are incorrect here. There is no sign that says where the "reception center" is, once you enter the base there is a sign that says "tent camping go right" and "recreation center left" I went to to recreation center thinking that was the office, HUGE MISTAKE!! The road is very narrow and comes to a dead end at a dumpster, there's no place to turn around so we had to disconnect our car which was a huge hassle in a tight space. What you need to do is turn RIGHT going toward "tent camping" the reception center is on the right side and you need to park in the large parking area to check in, then after check in you go back out and RV park is near the mobile homes near the entrance. RV park is kinda small but sites are large, only back ins. The reception center has a very nice souvenir store with a Starbucks coffee too. I think the $25/night with no weekly rate is kinda high though. We enjoyed our stay at Ft Fisher in early January, 2015 The sites are large and full service, although several are backwards (ie electric, water,/sewer, and/cable on wrong side), and pads are narrow. This can be overcome by pulling straight in, unhook, and pull TV through grass to back of RV. Base facilities are closed in winter, and that was ok with us. Wi-Fi is…ify. Cable required a converter (provided by MWR office) but worked fine. When we arrived it was one rig there, and we called the MWR office and they stated that we needed reservations… ok, but it is in the middle of the winter and one other camper is there. The washrooms/showers were excellent; water pressure and/hot water great. Staff was helpful in recommending restaurants (we recommend Jack Mackerel and drinks at Bud and Joes afterward). Located a few miles from Ft. Fisher and the Aquarium; excellent for bike riding and jogging and beach time during summer. The base is building new recreation villas that are looking great. We were heading south and took the Ft Fisher ferry to South Port, which was very enjoyable. DON’T PASS UP! Ft Fisher is an open base w/many camping spots. We had a large shady back-in site. Hookups were close & convenient but saw others were not always standard set up. Some sites required pull in w/water & electric on one side & sewage on other. Confusing & some moved unit around for most convenient layout. Amenities were amazing: had very nice swimming pool w/chairs, lounges & a few umbrellas for shade, activities center w/multiple items to rent, I.e. Bicycles, beach equipment, etc. There was a pier well used for fishing. Registration center had a mini-store of some food items, snacks, beach equipment & clothing. Received mail here & no problem since this was my first experience using a mail service. Ladies at the desk were very sweet. There is a war museum on the base. Base is located across the street from the ocean beach. Had easy parking w/in the base & walkway onto the beach w/cart. Weather was perfect most days & ocean was refreshing in the blistering heat. Disappointed in the access to the ocean since the entry to water had about a 12" ledge to step down (was a surprise unless warned). Ocean bottom was stoney & sharp shells, hard on the feet. Sand bar allowed one to go way out. Base had a restaurant & lounge overlooking the bay w/a deck. Great sunsets from this vantage point. Stayed 2 weeks & hated to leave. Stayed in the cottages these sorry I know they are building new but these should have been torn down years ago buildings are falling apart. We stayed for a week four cameras and nobody had the heart to photograph our sad green house. There are tons of programs on the base at very reasonable prices and the staff was friendly. The cottage next door had a dumpster in the front yard pretty ripe between dumping's. The place seamed like it would be great for rv campers may go back when the new cottages are complete but think I will chalk this up as a done that. What a great location and operation!! The staff at the Rec Center were terrific. We had three of our granddaughters with us. The Rec Center staff went out of their way to accommodate. The kids did ice cream making classes and how to fish for blue shell crabs. They got to eat both the crabs and the ice cream. As most of the reviews indicate - LOCATION LOCATION LOCATION. We took the ferry over to Southport for lunch and ate at The Cape Fear Rest. Food was okay but trip over was great. If you are here on Friday night, go listen to the live music at the Beach Bar and Grill. GO EARLY or you will not get a seat. ONLY CON - bath house was AWFUL. Worn out and desperately in need of repair. What could be considered a con but isn't - the reconstruction going on adjacent to the RV park. Simply not an issue. Go and enjoy. Here is the GOOD. Location is ideal to the beach. Two or Three minute drive. Kure Beach is lovely and quiet. Picture perfect for those seeking peace and tranquility. Camping locations are descent however little shade. You can rent golf carts for $20.00 a 24hour period. Inside the rental building is tiny gift shop. If you are using a Tent there appeared to be plenty of shade for those folks. There is also a pool AND a beautiful dock area reaching out into the Cape River. Views from the dock at sunset are very nice. The not so good. Ladies Bath House very small and not clean. We rented a mobile home as our friends used their travel trailers. So we had a mix of tent users, travel trailer users and mobile home renters. Our mobile home good points AC- I must say worked GREAT. A full size12 cup coffee pot was a must and well used every morning. Bring your own coffee filters. They had very old and over used pans (we brought our own frying pans) ample coffee cups and 8 plates were in the home. There is also a small grill to use. There is for guests use inside the mobile home a washer and dryer. Yes it was loud but I was thankful to have it, so I did not pay any attention to the noise. Bring your own folding chairs if you plan on sitting outside unless you don't mind sitting on the deck. The decks are in need of repair and we did get splinters. Inside: The carpets are awful and in serious need of being removed. Black stains, stains from bleaching to remove some stains. As the first thing you see when you walk in left me wondering how dirty everything will be. The sofa and love seat appeared to be as dirty as the carpet. Large bathroom area off the Master bedroom but the tube/shower combo was very small. Queen size bed was ok. Dressers had broken handles which is unnecessary if housekeeping is inspecting each unit. Second Bathroom down the hallway off of the two other bedrooms. Double beds in them. These units have 1980 mini blinds that are broken and do not keep sun out so you may want to bring eye masks unless you want to be wide awake at sunrise. We carry them with us for every trip we take. The cost of the mobile home does not match the product. If we would have paid $60.00 per night in spring I would have been semi ok with it. The unit was just too dirty and the quality of furnishings were awful. Sorry I would have much rather reported clean sleeping facilities but I can not. The location saved the day and the company we visited with. Fort Fisher Recreation /Beach is a diamond but demolish the mobile homes OR fix them up. Great for RV, tent and Travel Trailers. We stayed at site 21 which is in overflow area. This is the first overflow area that seems better then the normal open sites. We had 50 amp, water and sewer. We could see the water and the pier from our RV and close to beach for a nice stroll. Nice shade tree that gave us adequate shading to keep us out of the sun and we were even able to get satellite. We're only staying for two day's heading towards Florida after this. I could of stayed longer but have places to see.